"A touch of color can change everything!" This spring OPI takes nail color to the next level with revolutionary Sheer Tints, the brand’s first-ever, pigmented top coats. Sheer Tints by OPI offers a fresh take on traditional top coats with the introduction of four new vivid hues in Blue, Pink, Yellow and Purple. An infusion of transparent color with high shine, these top coats can be worn alone, with a base coat for a playful sheer or layered over any shade to create an alternate finish for a progressive nail look. "Nail color is all about self-expression; apply Sheer Tints over your favorite OPI Nail Lacquer to achieve your dream shade, accent glitters and darks or transform cremes and shimmers," explains Suzi Weiss-Fischmann, OPI Co-Founder & Executive VP. "Make a statement by creating an ombre design that is on-trend, then add several coats to create dimension." I'm Never Amberrassed - Liquid amber morphs into a veneer of yellow tint that is anything but bashful. Be Magentale with Me - Give your nails the sweet treatment with this sheer pink tint. Don’t Violet Me Down - You can count on this crystal sheer amethyst. I Can Teal You Like Me - It’s obvious you’re head over teal in love with this sheer blue. 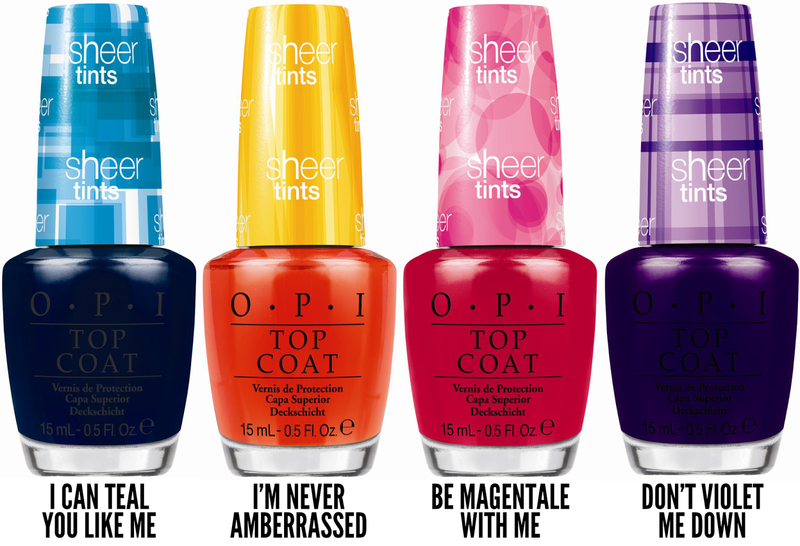 Sheer Tints features OPI’s exclusive ProWide Brush for the ultimate in application. Sheer Tints will be available March 2014, at Professional Salons, including Beauty Brands, Beauty First, Chatters, Dillard’s, jcp Salons, Pure Beauty, Regis, Trade Secret, ULTA and ulta.com for $9.00 ($10.95 CAN) suggested retail for each nail lacquer. I'm intrigued... can't wait to see swatches!